The internet in 2002, 2012 and 2022? 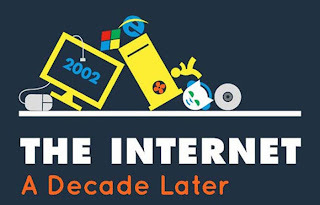 This infographic made me reminisce about what I was doing on the internet in 2002. Studying mostly, on my iMac … and if I remember correctly, I just got my (slow dial-up) online connection at home. Before that I had to work on campus, looking into Mintel reports and browsing internet explorer. And yes I created my first website (for a school project) on Netscape. Now a 2002’s website design is so retro, its becoming trendy again. The most staggering info on the infographic I though was the bottom part “Refusal to adapt resulted in a failure to thrive”. Consider how much our life has changed over the last 10 years… and and how it will continue to change the next 10 years. What will our internet needs be in 2022? Will the internet become leading in technological singularity? So no need for computers any more: writing down your thoughts (blogging!) is done merely via brain power and saved, shared and found in the Cloud? let me know what you think.